Court Reporting is a form of shorthand, or stenography, the object of which is to write at the speed of speech. Shorthand systems use a combination of symbols or abbreviations for letters, words, or phrases. Shorthand has been around since ancient Egyptians started writing. Modern, english shorthand was first popularized by Pitman and Gregg in the eighteenth and nineteenth centuries. This entailed writing short strokes and circles with pen on paper. Court Reporting is currently practiced as machine shorthand, with the shorthand writing being performed on a machine called a stenograph or steno writer. The first commercially available machine was invented in 1906 by American stenographer Ward Stone Ireland. All modern steno writers are a direct descendant of this. Modern steno writers like Advantage Software's Passport Touch or Stenograph's Luminex, are WiFi and Bluetooth-enabled machines allowing for real-time transcription of speech, which can be streamed live over the internet or broadcast TV. 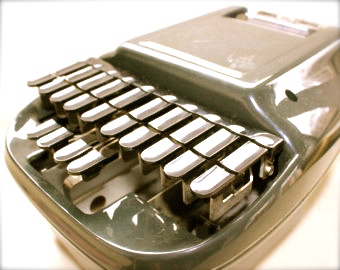 The most common method of court reporting, or stenography, uses a stenotype machine – a specialized word processor with a modified, 22-button keyboard. Using machine shorthand to spell words phonetically, a trained stenographer can record more than 200 words per minute. The fingers of the left hand spell out the beginning of a syllable, the thumbs type the vowels and the fingers of the right hand end the syllable. Single keys can be pressed, but keys are commonly pressed down in groups - like playing the chords of a piano. Stenographers spell out syllables phonetically, but there aren't enough keys to cover every sound. Combinations of letters are used to create missing consonants. for example, there is no "N" on the keyboard, so "P" and "B" are used together to represent that sound, e.g. the word "than" is "T H A PB" in machine shorthand. The example to the machine shorthand, or note, on the left and the english translation on the right. Each line represents a single stroke on the steno machine. The sentence took 13 strokes to complete, this is in comparison to 62 strokes (50 letters and 12 spaces) on a traditional QWERTY keyboard. How flexible is the work? Today’s technology allows captioners to work from home. Due to the varied career opportunities, the role of reporters continues to evolve. Court and Deposition reporters will continue to work within the legal community as it expands in the future, as well as develop their role as information processors and managers in the business and multimedia communities. This allows persons to choose whether or not to be their own bosses, as many reporters work as independent contractors or own their own agencies. The New York School of Court Reporting and Career Institute is an approved Eligible Training Provider for NY State Department of Labor and Westchester-Putnum One-Stop. This program allocates state funds to training qualified individuals. Please contact your local New York State Workforce One Stop Center directly to see if you qualify. The New York School of Court Reporting and Career Institute allows students to pay their tuition in monthly installments. The school is currently not offering Federal Student Loans. What are some real life examples of stenography? Before becoming famous as a writer, Charles Dickens practiced as a Court Reporter in London's Parliament. His struggles to learn shorthand became a subplot in the book, David Copperfield. The Court Reporters in the O.J. Simpson trial took down more than 1 million lines of trial transcript. The Court Reporter who accompanied Richard Nixon during part of his 1968 presidential campaign delivered transcripts of television show appearances to the media faster than the networks. A former stenographer for Paramount Pictures founded the Mattel Company and introduced the world to the Barbie doll. The federal judge who later became the first commissioner of baseball began his career as a Court Reporter. Actresses Michelle Pfeiffer and Kim Delaney once studied to be Court Reporters. Court Reporters have taken depositions or court proceedings of multitudes of the rich and (in)famous: Elvis Presley, Bill Cosby, Joan Collins, Jimmy Hoffa, Frank Sinatra, Isley Brothers, Jacqueline Kennedy Onasis, Muhammad Ali, Alex Haley, Michael Bolton, John Lennon and Yoko Ono, Michael Jackson, Jay Z and others. Legal actions on behalf of all Americans are recorded by Court Reporters. What is The Court Reporter's Creed? "My profession stems from humanity's desire and its necessity to preserve the happenings of yesterday and tomorrow. I was known as a scribe in Judea, Persia and the Roman Empire. I put into written language man's first landing on the moon for the world to read. I translate spoken words into written words for deaf and hard-of-hearing people. I create the instantaneous closed captions on television for all people to read. I discharge my duties with devotion and honor. Perhaps I haven't made history, but I have preserved it through the ages. In the past I was called a scribe. Today I am the Court Reporter that sits in the courts of my country. I am the reporter who is the keeper of the Congressional Record of the United States. I am the verbatim Court Reporter!" How long does it take to start a career? Within two years, you can be on your way to a rewarding career in Court Reporting According to the Bureau of Labor Statistics, Court Reporting jobs are projected to grow faster than average. With an average New York State salary of $98,000, careers in Court Reporting and Closed Captioning are lucrative options for individuals seeking job security. We are licensed by the New York State Department of Education and our experienced faculty has been devoted to training successful Court Reporters for over 20 years. When did the profession begin?